John Edwards hunts among the graveyard dust for some way out of the all-encompassing horror that is CARNELL. Methzar grew bitter and joined forces with the Snow Queen and her army of ice giants, and an alliance of evil was formed. 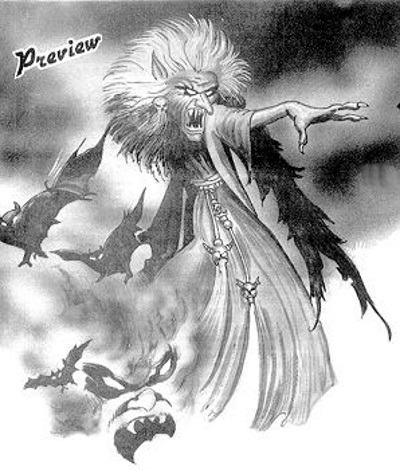 Into this alliance came Magra, the witch of the Black Mountains, whose cannibalistic nature and ugliness made her the most feared witch in all the lands. Together they planned their strategy and over two years formed an army of the most grotesque creatures ever to walk the earth. Black Crystal and Volcanic Dungeon are names that instantly create images of mysterious mythological fantasies. If you are an Adventure freak then they are, no doubt, names that are familiar to you as the titles of two of the most successful adventure games around. Now, from the same team of Roy Carnell and Stuart Galloway and their company Carnell Software, comes a sensational new adventure unlike anything created before — The Wrath of Magra. Great dark veils of secrecy cloak its development and I had to lure Roy and Stuart to a local cavern, ringing with the sounds of glasses clinking, and use that most potent of magic spells ‘What’s yours?’ before I was divulged any of the mysteries surrounding Magra. Such enticing tactics, smacking of film studio security, combined with the release of tempting snippets about the awful witch, have already resulted in The Wrath of Magra being tipped as the ‘Ultimate Adventure’ and a sure fire hit for Carnell in 1984. It will come as no surprise to learn that as two guys who have a genius for creating adventure plots, both Roy and Stuart have a background of work in the film industry. 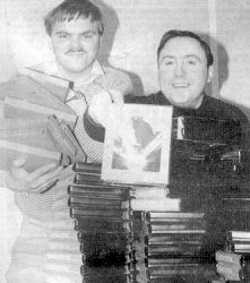 They were both involved in the optical special effects on Superman after meeting special effects master, Wally Veevers at Birmingham Film School. They were naturally up to their eyes in mythology and legend when creating the surprises in the film about King Arthur and magical Merlin, Excalibur. All of the Carnell adventures are centred on the European part of the Third Continent — the time when the great land masses of Europe, America and Africa were all one. At the end of the Third Age of the Third Continent, the time of Black Crystal, a great battle was fought and the armies of evil were destroyed, and the balance of the forces of good and evil were restored. Now with The Wrath of Magra you find yourself at the beginning of the Fourth Age. In the Wrath of Magra, you play the hero from Volcanic Dungeon and, as the title suggests, you are facing the anger of Magra. She’s a nasty piece of work if ever you saw one, and well deserving a seat in the ‘snug’ at the Rovers Return! The evil old witch lives in a castle in the Black Mountains. In previous battles Magra was killed, but only in a physical sense — her body was returned to her castle by the ice giants, and now she has been brought back to life by the powers of magic. She is furious and recaptures the Princess Edora, imprisoning her in the castle. So the stage is set for you to make a fascinating journey of days, weeks or even months, to battle with the demonic forces awaiting you. The adventure consists of two cassettes and a 200 page paperback of essential reading — more of this later. The two cassettes contain three 48K programs. Looking suitably evil, Stuart Galloway and Roy Carnell fend off the forces of good with their Black Crystal. At the start of the first program you are a rather helpless, inexperienced hero, who has got to pick up some pretty sensational magical powers rather quickly if you are going to succeed in your quest. As a novice wizard you will need to acquire knowledge, ingredients and weapons to commence your magical work and build up your prowess and confidence. Nothing comes easily in this game. There are over 100 weapons and ingredients to be found or created before you can mount the final onslaught on the witch. Many weapons have to be formed — you won’t find a Saintly Staff just lying around. You may come across a staff but then your magical powers will have to discover a dead saint and some graveyard dust to change the staff into something special. Starting in the valley, you are reasonably safe. There is a village nearby, though it isn’t a good idea to trust all the villagers. You commence your quest by finding the entrance to the mines under the Black Mountain. The game runs in real time — ten minutes playing time equals one hour, so time is an important element. Some spells can only be done at special times or at a certain phase of the moon. This could mean waiting for a month! But don’t worry, you can ‘fall asleep’ and bang goes eight hours. But watch out — nasty things can happen while you are sleeping! Once you get into the mines in part two you will need all your knowledge and weapons from part one to combat more than forty monsters and supernatural beings as you force a path towards Magra’s castle. It’s a decidedly disquieting experience. Scoring is continuous throughout the game and you must watch many things. Your physical strength must not fall too much and you must sleep every 48 hours. Physical strength and faith get boosted when some magical spell goes successfully, and the reverse is also true. Wounds, naturally, can mount up in the various battles. And not least, your gold pieces need careful guarding as you never know when someone might want a bribe! If you have got this far it will have meant making many references to the 200 pages of magical information contained in the accompanying book. As the adventure takes a long while to play you will probably be saving the game at an appropriate moment and disappearing up to bed with the book to plan the next day’s campaign, hone up your magical spells and generally swat up on the Third Continent. Only when all this has become second nature are you ready for the third and final stage. You have made it through the mines and at last Magra has you just where she wants you — on her own territory, in the castle. She will pop up anywhere, any time, setting traps and being thoroughly unpleasant. If she fights you must defend yourself. She is all-powerful in her own domain, so you are going to need every ounce of protection and knowledge to win the final conflict. But all the surprises are not over yet! Only by the powers of alcohol did I prise from Roy and Stuart the wicked twist of fate awaiting you. It’s new, it’s devilishly cunning — it’s Evolution. In the final stages the monsters awaiting you are creations of pure computer science. Your Spectrum takes control to create unknown perils, things beyond even the wildest dreams of the programmers themselves. Every game will evolve its own climax. Will you be able to handle The Wrath of Magra? Whatever form it may take — only you will ever know.